Ficus Benjamina or as it's more commonly known, the Weeping Fig, is a common indoor houseplant which comes in multiple different looks and styles. It can be grown as a tall indoor tree with leafless braided trunks, or a tall bushy indoor plant, or even as a short pot plant. 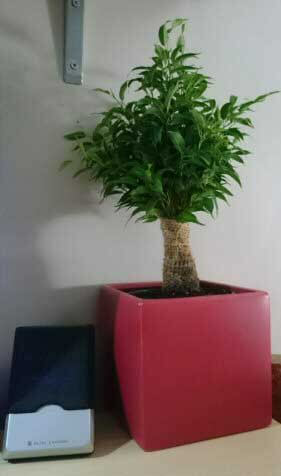 You might also come across this houseplant also being grown happily as a Bonsai Tree. The leaves on the all green variety are unremarkable and because the Weeping Fig is not a flowering houseplant, its main attraction is the overall shape and elegant appearance that it creates. 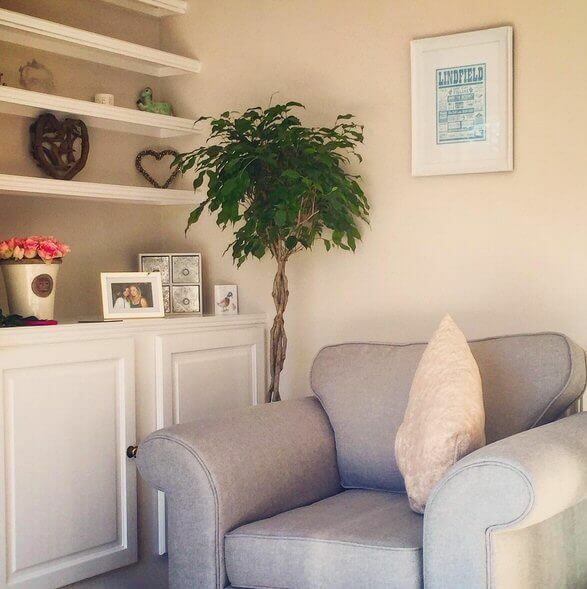 This growth pattern means with reasonable care, you can have a tree-like indoor plant which is both grand and impressive but at the same time graceful and tranquil. So is there anything that's not to like? Well, as a house guest it can be a little messy. 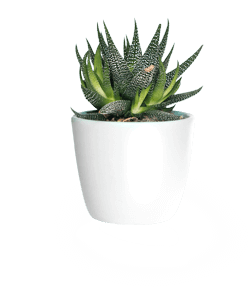 However for the most part, this is an easy going, versatile houseplant that needs minimal attention but will still reward you with something quite appealing to look at. It also fits into many settings from traditional to modern and can really bring a drab corner to life. Weeping Figs tend to be reasonably priced and are frequently stocked anywhere that houseplants are sold. 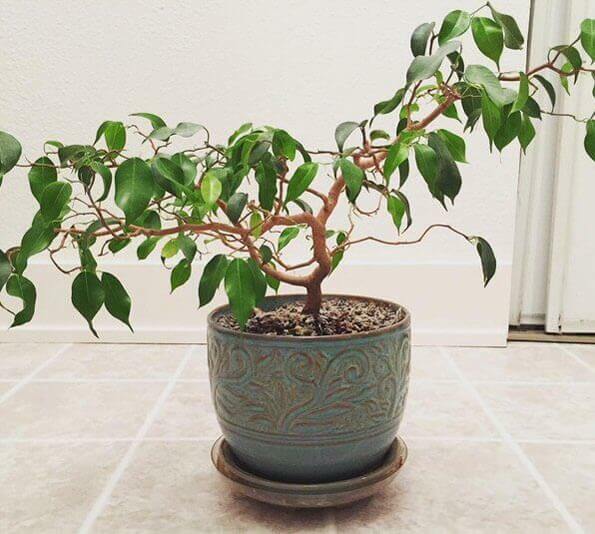 It's also an excellent plant to have around if you suffer from poor indoor air quality as like most ficus plants it cleans and filters the air of harmful pollutants. Aside from varying height and physical appearances, the only other factor to consider is the leaf colour. The all green variety, F. benjamina is perhaps the most common and easiest to grow, but there are several variegated varieties available if you prefer. The most beautiful of the variegated types is perhaps F. benjamina 'Starlight' - it has small patches of green on the leaves but large sections are cream coloured (see the picture above or in the gallery). Although its look is unusual it's not overly popular so you may need to search it out from specialist growers. 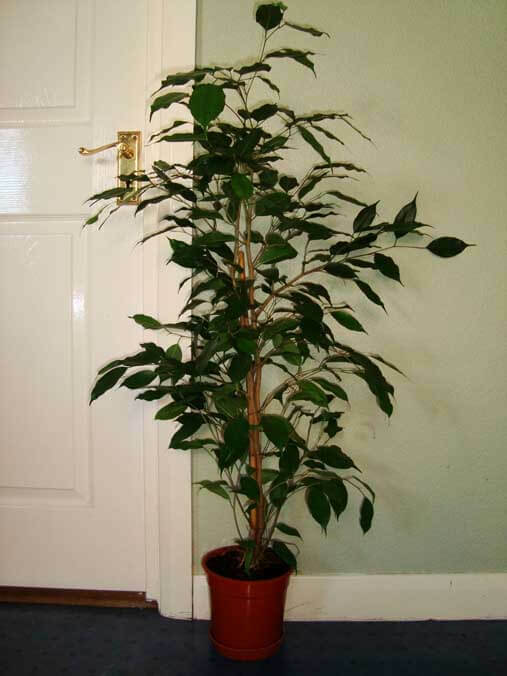 Your Ficus will need a location which is fairly bright in order for it to do well indoors. Some shade is okay, but you do have to be careful as if the light levels are too low then in a short time your Weeping Fig will tell you it's unhappy by shedding leaves. Some direct sunshine will be fine, but midday sun could be too much for your plant, so early morning or late afternoon sunshine is best. Most Ficus plants are normally tolerant of occasional watering mistakes, so giving too much or too little from time to time will not usually do any long term harm. For a thriving happy plant you will want to get it right though and that means keeping the soil moist for much of the time. In other words, the potting soil shouldn't be a soaking, sodden mess and equally, it shouldn't resemble bone dried dust. The humidity in your home or office isn't overly important. Insufficient watering will mean the humidity needs to be higher and too much watering will mean low humidity levels are needed to decrease the chances of your plant rotting. Clearly the best option, therefore, is to be able to ignore humidity as a care requirement completely and to be able to do that, you just need to water it correctly by following the watering instructions above. The leaves on your Weeping Fig might look small, but there is a lot of them, which means it can be quite a heavy feeder. To keep yours happy with lush green leaves, look to feed up to once every month during the growing seasons, none needed in Winter. The average temperature in the standard home or office is brilliant. If you're comfortable temperature wise, then so is your Ficus. For active growth to occur the temperature needs to be at or above 15°C / 59°F. Always keep your plant out of cold draughts. Very young plants need to be repotted every year or so, this is because they can grow quite fast and will need space for their roots to establish. Newly brought plants from a store which are a good size will most likely be mature enough to need less frequent repotting and so you'll only need to repot every two or three years. Plants older than this will only need very occasion repotting, otherwise you risk heavy leaf fall. Very mature Weeping Fig's which are heavy to move, are best off not being repotted at all (unless you feel it's essential). Instead, they benefit more from scrapping off the top inch or two of soil and top dressing with fresh compost every couple of years. If the stems are quite young, supple and "new" opposed to older more woody ones, then you can propagate the Weeping Fig through stem cuttings. Cut a stem matching the above criteria, which is an inch or two long and then remove some of the leaves from this cutting if there's a lot. Two or three remaining leaves is ample to get the new plant going. Push the cutting a few centimeters into fresh potting soil and keep warm and the soil moist. Use a rooting hormone to increase your chances and if possible keep the compost warm by providing bottom heat, which can be achieved by using a heated propagator. New leaf buds should start to form after a month or so, it may take longer in some instances but providing the stem is still "alive" the time it takes is not something to be concerned about. To create a "bushy" look, take several cuttings and grow them together as "one" plant. A Ficus which has all its needs adequately met will grow moderately fast. This basically means it grows quick enough for you to notice it changing in shape and size, but not so quickly that it constantly outgrows the surrounding available space. The maximum height you can expect in an indoor Ficus Benjamina is 2m / 6ft. They do not reach this height quickly so if you've brought a small plant initially it will be many years before it reaches this tree-like size. 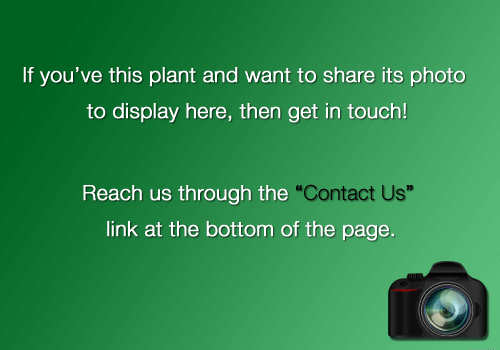 That could be good news if you bought a small plant and want to keep it that way. If on the other hand you want something tall quickly, buy a large Ficus to start with. Width wise, most Weeping Figs tend to be tall and slender rather than wide and spreading and so won't normally be wider than 0.5m / 50cm at the very most. Flowers aren't common. This type of Ficus is only grown indoors for its overall physical appearance and shape. Is the Weeping Fig plant Poisonous? The Weeping Fig is a Ficus which means the sap within the plant is generally mildly toxic to most pets and people. It has a milky irritating sap in the stems and leaves that can cause gastrointestinal issues if eaten and skin irritation if the sap is allowed get into small cuts on the skin. Your Ficus Benjamina will sometimes need pruning, either because the shape is out of control or there will be dead sections that need removing. Winter or early Spring is the best time for trimming live growth and you can just prune out any dead material at any time during the year. Simply cut the plant into shape, just remember not to be too aggressive and do not cut back into the main woody part of the stems. The most commonly reported problem and request for help is because the leaves on someone's Ficus are falling, often in huge numbers. It's obviously not good appearance wise, but it's perfectly normal and not something you need to be really worried about. It happens because your Ficus is quite smart but also rather sensitive to change. It wants its leaves in certain angles and positions to maximise the available light to allow photosynthesis at its full potential. When you rotate, or move your plant, the light dynamics change massively and the plant responds by shedding leaves and growing new ones in the most efficient angles again. It's a clever skill but can create an ugly look that can ruin the look of a mature well-grown houseplant. As a general rule, smaller younger plants are less likely to drop leaves when compared to taller and older ones. To prevent and avoid this problem is simple; when your plant has an established home don't keep moving it around. Find a spot for it where it can stay put all year around out of draughts and away from wide temperature changes. Unfortunately your plant, as versatile and as wonderful as it might be, can be susceptible to pests. 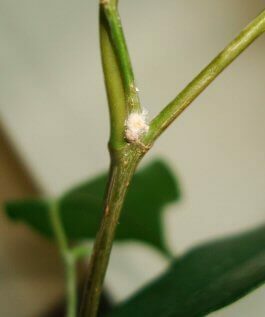 In particular infestations of Mealybugs and Aphids can be quite common and difficult to shift due to the large surface area of the leaves. Having so many leaves means plenty of places for pests to hide themselves which can make them tricky to get rid of. Follow the tips in the above links for guidance, but remember to be patient as it can take several treatments to be pest free. 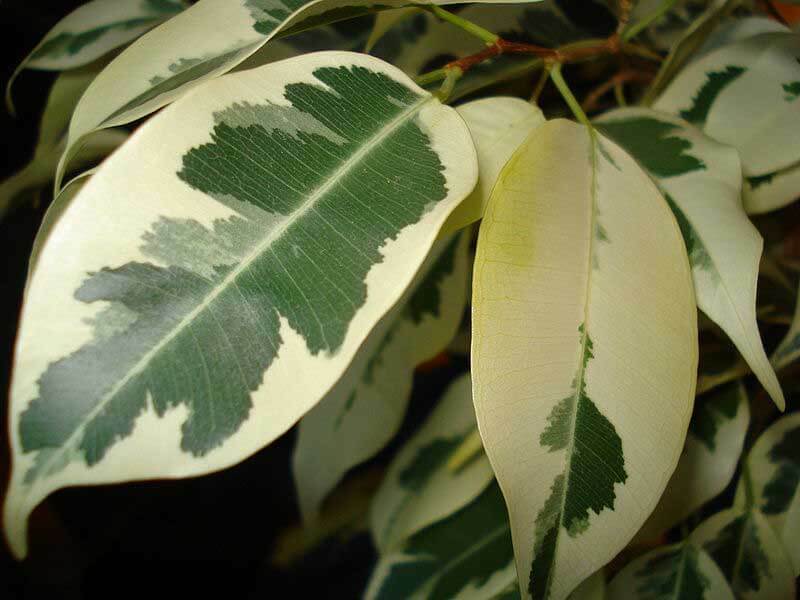 The bottom leaves of a Ficus will turn yellow and fall in time. You're not doing anything wrong as this is inevitable and is common with many houseplants. If it looks like the one in the picture then it's quite common and nothing to be concerned about. 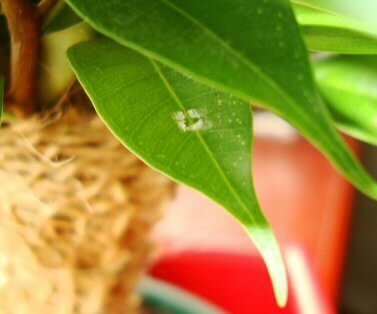 These spots are white, waxy and circular and might initially be confused with disease or pests but are actually characteristic of some Ficus plants. But what is it? Well, no one is completely sure. Although it's generally believed to be either the plants way of getting rid of a build up minerals and salts in the soil, or it's a way to attract pollinators such as Fig Wasps. It tends to wear away by itself given time, but if they annoy you, the white spot can be wiped off quite easily. This is normally a symptom that gradually creeps and spreads to new leaves. In most cases it's caused by prolonged underfeeding. To resolve the problem and prevent further leaves becoming affected you need to feed your plant. But don't overcompensate for previous underfeeding. Follow the instructions on the packet or bottle and don't exceed the stated dose.